A precursor of modern academic journals, this quarterly periodical, published between 1810 and 1829 and now reissued in forty volumes, was founded and edited by Abraham John Valpy (1787-1854). Educated at Pembroke College, Oxford, Valpy established himself in London as an editor and publisher, primarily of classical texts. Edmund Henry Barker (1788-1839), who had studied at Trinity College, Cambridge, became a contributor and then co-editor of this journal, which fuelled a scholarly feud with the editors of the Museum criticum (1813-26), a rival periodical (also reissued in the Cambridge Library Collection). 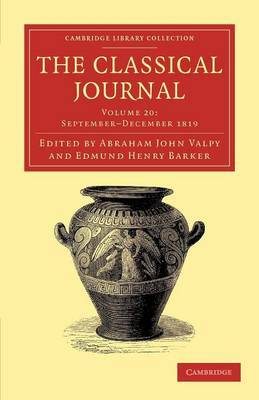 Although its coverage overlapped with that of its competitor, the Classical Journal also included general literary and antiquarian articles as well as Oxford and Cambridge prize poems and examination papers. It remains a valuable resource, illuminating the development of nineteenth-century classical scholarship and academic journals. Volume 20 contains the September and December issues for 1819.